Fast and accurate SpO2 spot checks anytime. 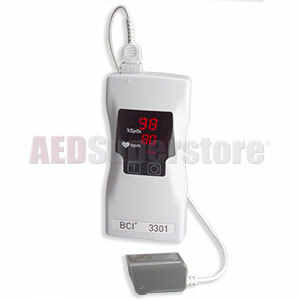 The BCI 3301 by Smiths Medical hand-held pulse oximeter quickly and reliably delivers pulse oximetry wherever spot-checking is needed...including EMS, physician's offices, outpatient clinics, hospitals, and at home. In fact, its ergonomic design, easy-to-read display and proven ability to accurately indicate SpO2 and pulse rate for patients from neonate to adult have helped make the manufacturer the global leader in hand-held pulse oximetry technology. One year manufacturer's limited warranty. Includes adult sensor, or you can substitute an ear sensor or a pediatric sensor by using the drop-down window above.